I'm a stock options trader in Singapore. I'm involved mainly in US equity and ETF option trading. I used to trade Earnings Gapping for a while, 4 years to be exact, but has since stopped using it because it's highly unpredictable; more like gambling. I've later attended a 4-months stock option trading course taught by Mr Michael Woo, where he covered most of the foundations in trading. I've also learned about e-mini trading from him. Currently I'm doing swing trading of US stocks using options. 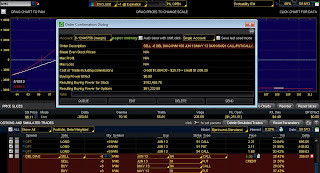 Iron Condor - Learn How to Tweak, Grab More Profits! 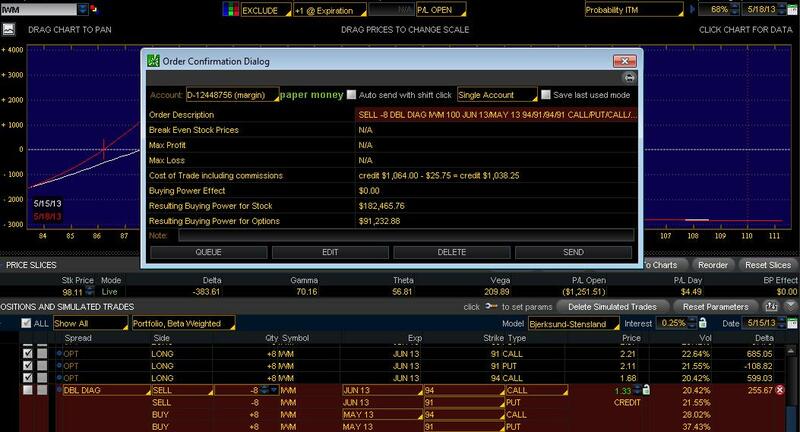 On 21/5/13, I established a new DIA Iron Condor position using The ‘Uncle Joe’ Iron Condor Trading Plan. I sold 8 contracts of DIA Iron Condor. Capital outlay = $1,600. Possible credit = $679. On 21/6/13 when Dow keeps dropping around 300 points, position earns about $200. 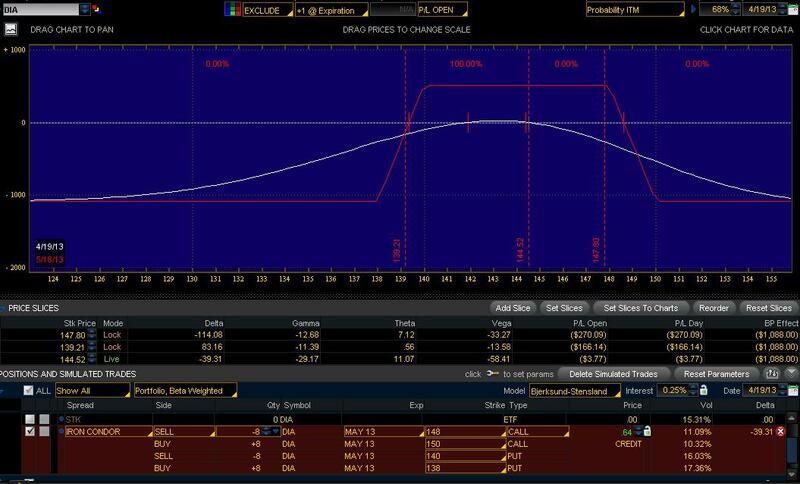 On 24/6/13, the 8 X bear call spread portion of the DIA iron condor was closed at the limit price of $0.20. I've decided to close the rest of the positions on 24/6/13, and captured a profit of $154 ($259 - $105 commissions). Profit of $154 out of the risk capital of $1600 comes out to be about 9% gain for a trading period of about 1 month. PS. You can find out more on how to set up an 'Uncle Joe' iron condor position over here. On 21/5/13, I've established a new DIA Iron Condor position using The ‘Uncle Joe’ Iron Condor Trading Plan. Sold 8 contracts of DIA Iron Condor. Capital outlay = $1,600. Possible credit = $679. As of 24/5/13, I've made some adjustments to my iron condor position from what I've learned from the Iron Condor Course by widening the wings at both ends of the iron condor. This helps to lift the current white profit line at both ends of my iron condor option position considerably. 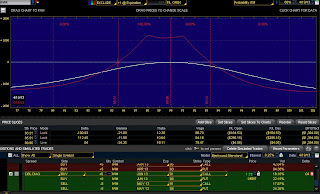 As usual, I will monitor my iron condor option position daily and apply the adjustment techniques when necessary. Basically, the technique is to establish a iron condor options position which has at least 50 to 60 days till expiration, instead of the normal 30 days till expiration options. 1. higher capital outlay for setting up such a position. 2. because the position has a longer period till expiration, you may likely adjust the position during the life span of the iron condor. 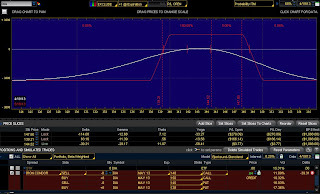 But the iron condor course provides many techniques (a total of 10 techniques) on how to adjust the iron condor position to minimize further losses and could also turn the position around. I will apply the adjustment techniques when necessary when the live price starts to threaten the determined maximum pain point. On 19/4/13, I bought 8 contracts of IWM Double Calendar. Capital outlay = $1,432. Possible credit = $1,111. The stock market kept moving up in a bullish trend. I have adjusted the double calendar position once. However, the price surpassed my determined maximum pain point and I was hoping the price would retreat. It didn't. *** You can subscribe to the free newsletter in the above link to understand how to determine your maximum pain point level - the price level that you really need to consider adjusting your iron condor position. Thus, I decided to close the original plus the adjusted IWM Double Calendar positions on 15/5/13. This incurred a loss of $1256 plus commissions of $112. If I had held on my position till the option expiration on 17/5/13, I would have lost more because IWM has reached a new high of 98.99. Sold 8 contracts of DIA Iron Condor. Capital outlay = $1,088. Possible credit = $512. The US stock market kept moving up. The Dow Jones Industrial Average reached 1,4973.96 points on 3/5/13. The SP 500 kept touching record high and reached 1,614.42 points on 3/5/13. 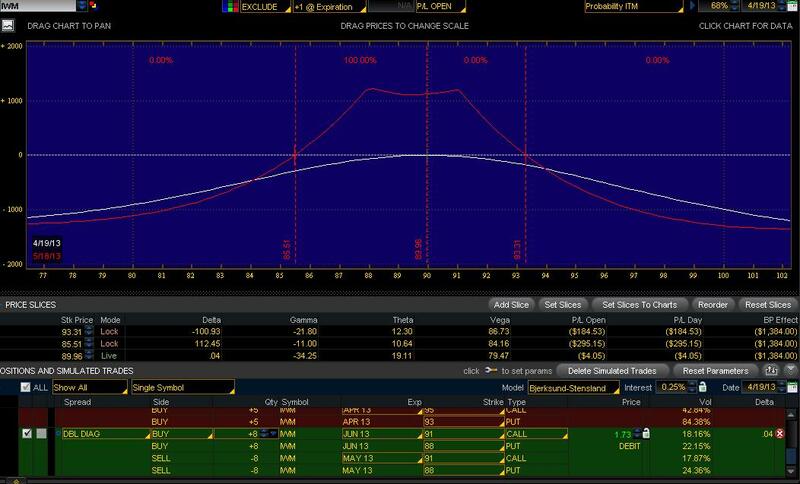 My DIA 138/140 bull put spreads reached their contingent buy back level and were closed on 30/4/13. I was following this iron condor adjustment technique to buy some calls on the losing side of my iron condor. But I've mistakenly bought back some of the sold sides of my original bear call credit spread (ie. the 148 Calls) instead. It was a mistake but another great lesson learned as always. Following the same iron condor course guidelines, I've placed some additional adjustments to minimize the loss incurred from the wrong adjustments. The course thus helps guide me to decide what to do when things go wrong with my iron condor option trade. Thus when the market kept going up, I closed my DIA iron condor on 7/5/13 when there were minimal damage (at one point I was losing hundreds). I lost $48. But the wrong adjustments and remedy adjustments incurred a total commissions of $145 for the whole position. I hope to be profitable in my next iron condor trade. "How To Avoid The 5 Silly Options Trading Mistakes I've Made". Written by - Tony Chai. These rules may seem "common-sense" but I believe they will save your hard earned money, if you are aware of them. To claim a copy of this e-book, please send an email to forex5147@gmail.com with the email title "5 silly mistakes" and I will follow-up with you. Thank You. Though physically disabled, I aspire to earn a decent income from my efforts in internet marketing and trading in the stock & commodity markets.